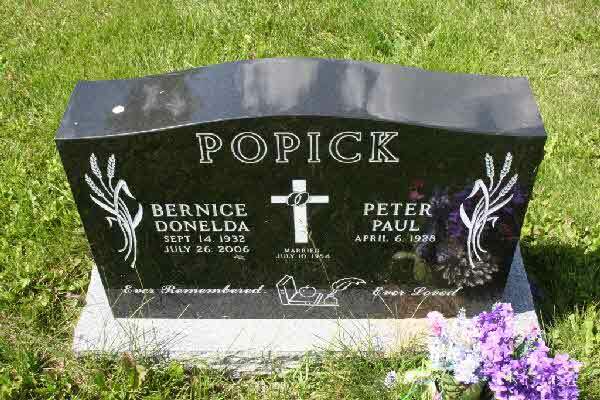 Marriage* Bernice Donalda Shier married Peter Paul Popick, son of Alex Popick and Paulina Zadorozna, on 10 July 1954 in St. Basil's Greek Catholic Church, Regina, Saskatchewan, Canada. 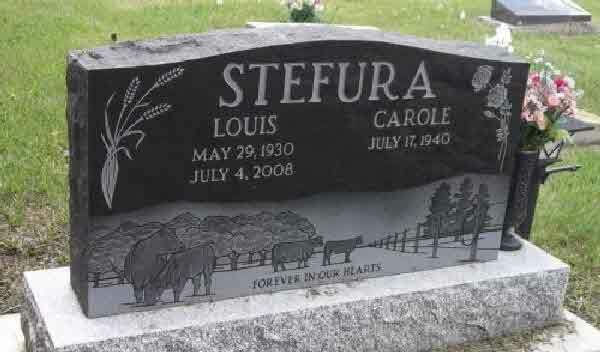 Burial* She was buried in St. Joseph's Roman Catholic Cemetery, Langenburg, Melville Census Division, Saskatchewan, Canada. 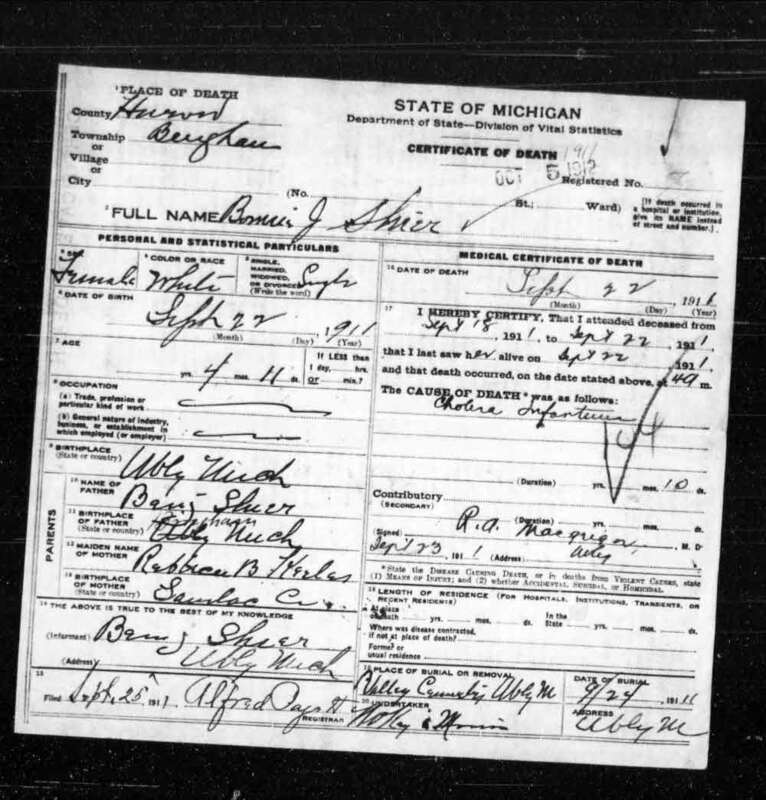 Marriage* Bertha H. Shier married William E. Ebbeler, son of Ernest Ebbeler and Minnie Wurrenburg, on 29 May 1923 in East Jordon City, Charlevoix County, Michigan, United States. 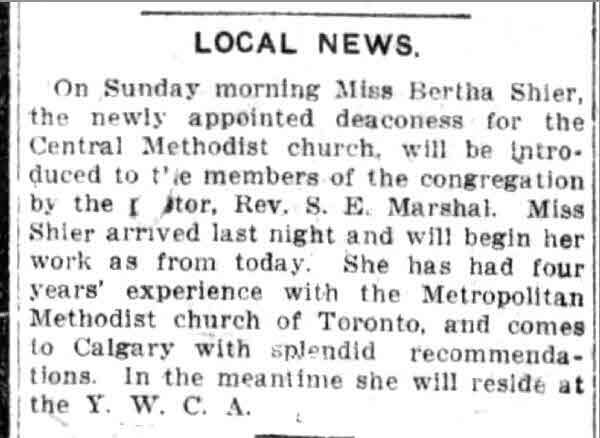 Fact 1 Bertha Shier became a deaconess in Calgary, Alberta. 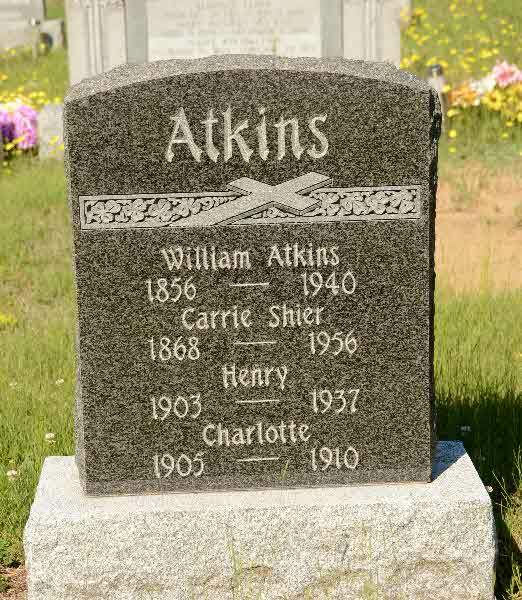 Death* Bertha Marie Shier died in 1937; Bertha Shier was the youngest child of the large family of Adam and Maria Shier, pioneers of Brock Twp. She was born Feb 1, 1873, educated in public school No. 9 Brock and afterwards in the Collegiate, Lindsay. 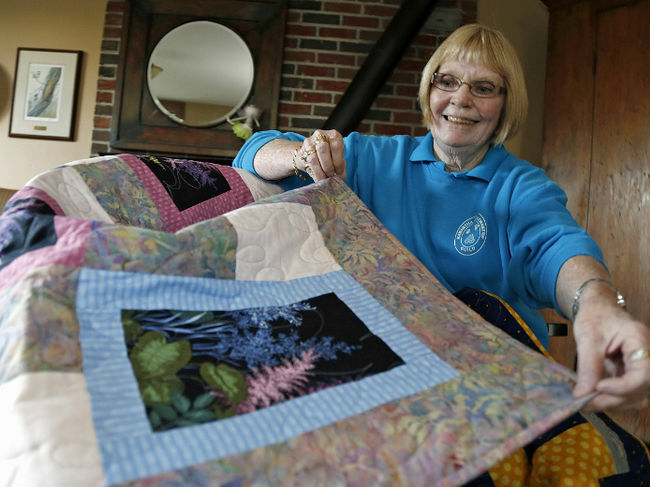 Early in life she felt the call to the "Deaconess Order" of the Methodist Church. Owing to the death of her father in 1895, she felt her mother needed her at home. 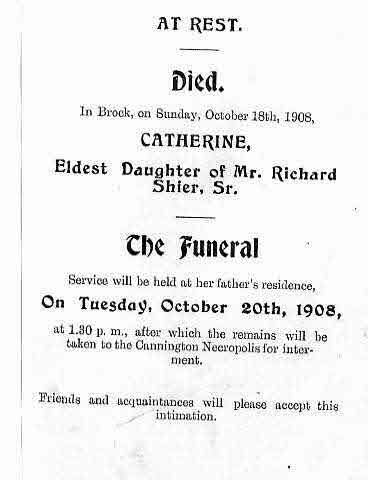 Her mother died in 1901. 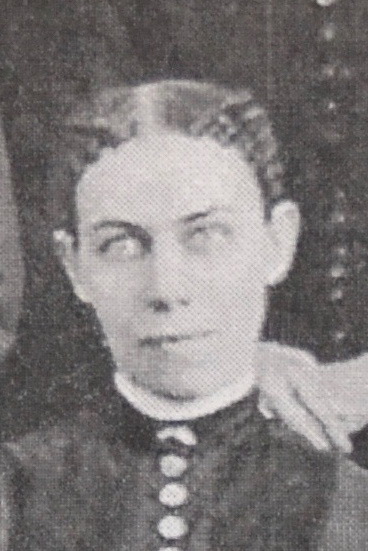 Then Miss Shier entered the Training School for Deaconesses in Toronto, graduating in 1903. Her appointments were St. Paul's Church, Avenue Road, Toronto, 1903; Brunswick Street Church and Jost Mission, Halifax Nova Scotia, 1903-1908; Metro Church, Toronto, 1908 - 1912; Central Church, Calgary, Alberta, 1912-1913; on leave 1913-1915; St. John's Orphanage, Newfoundland, 1915-1916; Rosemont and Verdun Churches, Montreal, 1916-1919; Traveller's Aid Work, Montreal, 1919-1920; Delorimier Church, Montreal, 1920 -1924; Zion Church, Montreal, 1924-1930; retired from active service , 1930. These facts show that the deaconess Shier spent an active and varied career in the service of the order. In 1930 she accompanied her brother, the Rev. J. W. Shier on a tour of the European Continent, then settled in Barrie to be near her sister, Mrs. Albert West. There she remained for five years. She worked as a private member of the Collier Street Church, under the pastorate of Rev. J.J. Black, B.D. , now of Cambridge Street United Church, Lindsay and rendered most effective service to the congregation. 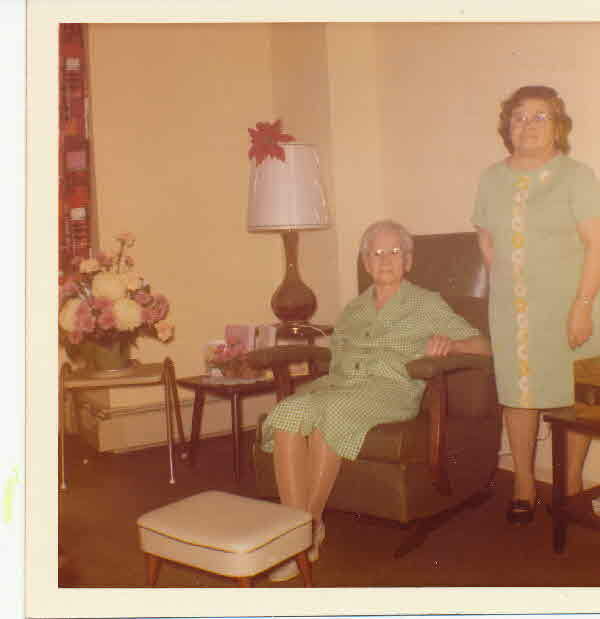 Her health became impared and in 1935 she went to Beaverton and spent some time with her sister, Mrs. M. J. Hurren. The last year of her life was spent at the Barbara House on Jarvis Street, where she gave special attention to her health. She had lived most strenuously during the long term of her active life, and after her retirement gave her best to the congregations with which she was identified. The strain was more than her nervous system could bear and it broke down. She passed to the Great Service beyond, December 1937. Burial* She was buried in Maxwell Union Community Cemetery, Grey County, Ontario, Canada. Burial* She was buried in Flesherton Cemetery, Artemesia Twp., Grey County, Ontario, Canada. 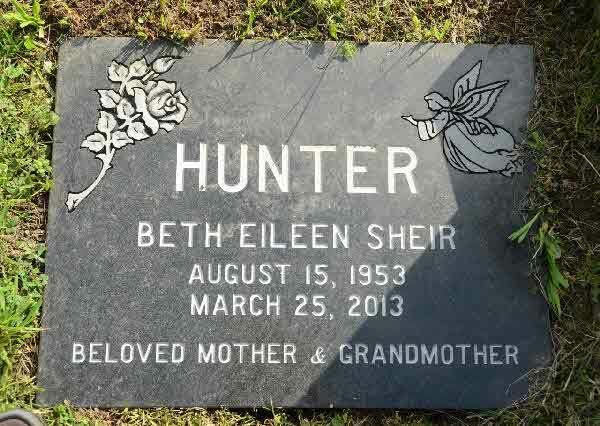 Burial* Betty Shier was buried in 1945 in Flesherton Cemetery, Grey County, Ontario, Canada. 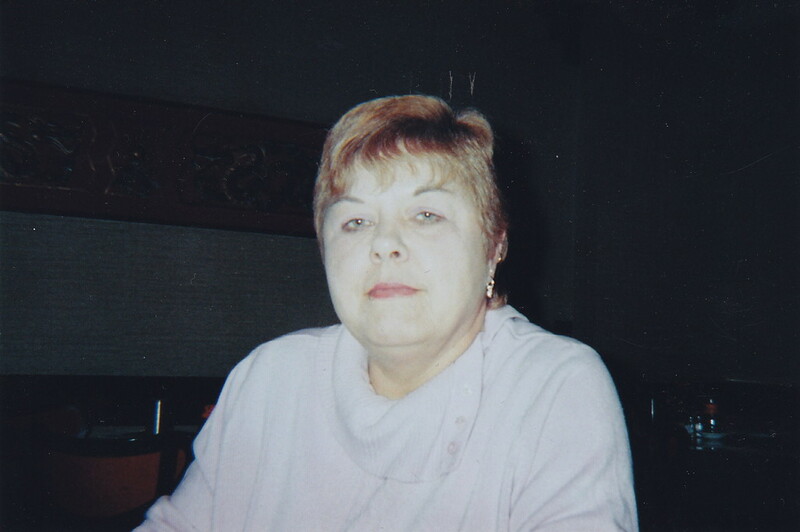 Death* Beverly Davison Shier died on 29 April 2017 at age 85; Beverley Davison Barteaux was born Feb. 14, 1932 on the family farm in Crandall, MB, to Clarence and Helen Shier. was predeceased by her parents and her brothers Gerald and Barry. Bev spent her childhood on the family dairy farm and completed high school in Crandall. Upon graduation, Bev took a course to teach school and was hired by the Oxford School in Wattsview. Phil Barteaux heard about the new school teacher and went courting. They were married July 14, 1951. Bev only taught one year as marrying a farmer was a busy life. 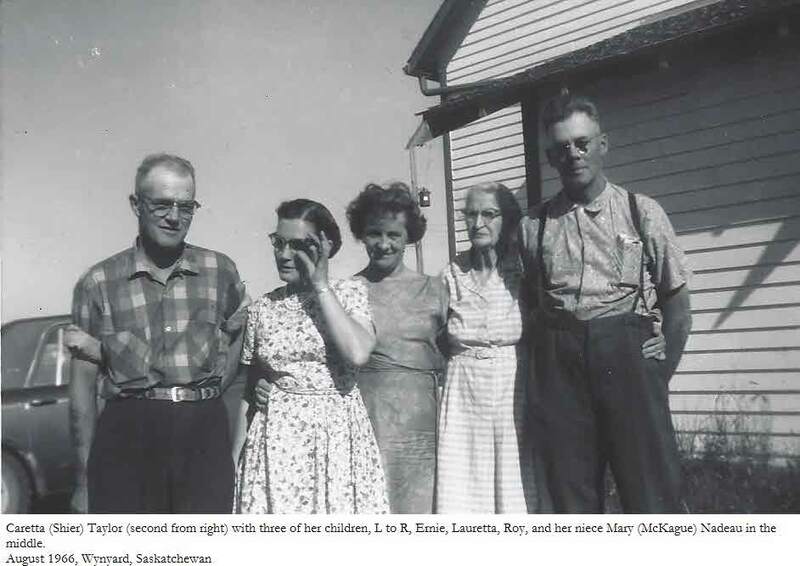 Phil and Bev ran a mixed farming operation and raised seven children. 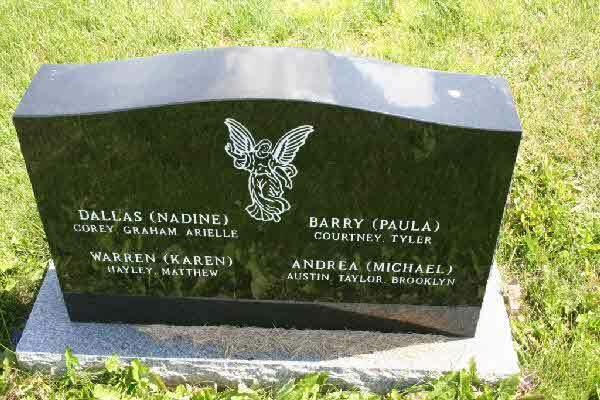 Linda (Morris Butcher, Wayne (Debra Admussen), Connie (Glenn LaMarche), Karen (Dwayne Clark), Glen (Dana Hutchings), Dale (Evelyn Bertram) and Janette (Sean O'Brien). Morris and Dale passed away in 2016. Bev is also survived by 18 grandchildren, 14 great-grandchildren and two baby bumps. lived to 85, Bev had time to be involved in many things. Family was very important to her and much of her time was spent feeding, clothing and teaching her children. Harvest time added to the chores as many suppers needed to make it to the field. 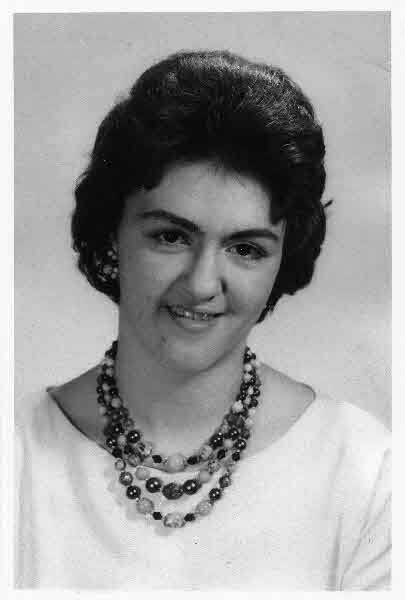 Her other interests were baseball, painting, gardening, ceramics, quilting, camping, cards and games, family dances, sewing, watching curling and travelling. over the years she fit it all in. Phil and Bev had many memorable trips, some highlights being New Zealand, Nova Scotia, Penticton and an Alaskan cruise. 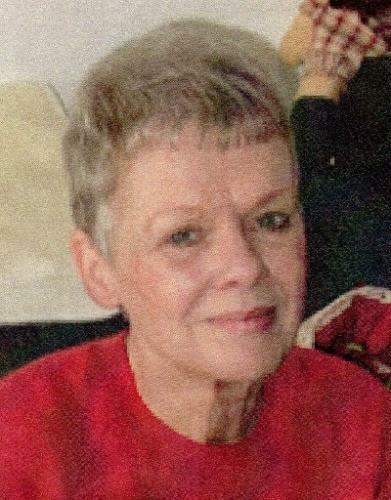 Bev led a busy and happy life with the love of her life, Phil. She was a unique woman, smart, loving, feisty, courageous, comforting, wore her heart on her sleeve and was always open to learning new things and teaching others. Well known for the "perfect pie"... sour cream raisin. past few years took its toll on Bev's health. Her mind remained sharp, but her body did not co-operate at times. With the support of her loving family, her last few months were as comfortable as possible. Her passing on April 29, 2017 has left an enormous hole in our family. 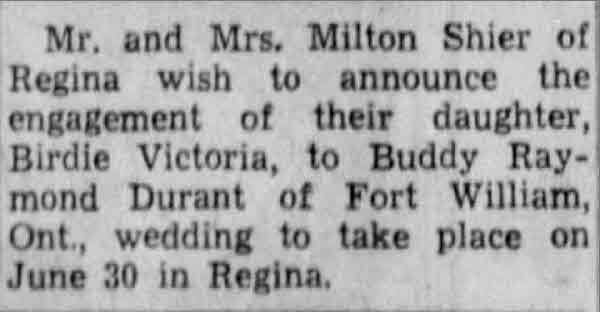 Marriage* Birdie Victoria Shier married Buddy Raymond Durant on 30 June 1948 in Regina, Saskatchewan, Canada. 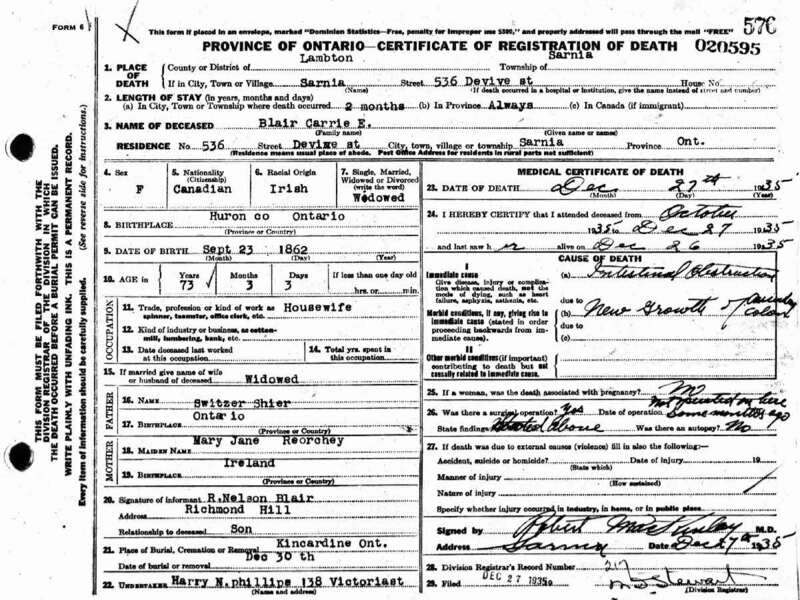 Death* Bonnie Shier died on 22 September 1911 in Bingham, Huron County, Ontario, Canada, at age 4. 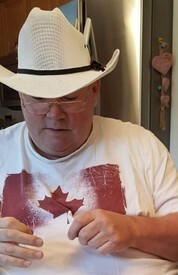 Death* Brian David Shier died on 16 April 2016 in Grey Highlands Twp., Grey County, Ontario, Canada; SHIER - Brian passed away suddenly at his home in Grey Highlands on Saturday, April 16th, 2016. Brian David Shier, in his 62nd year, beloved husband of Beverly (Senger) Shier, loving father of Leslie Shier of Orillia, Donald (Sarah) Shier of Dundalk and Jacob (Jennifer) Shier of Eugenia. 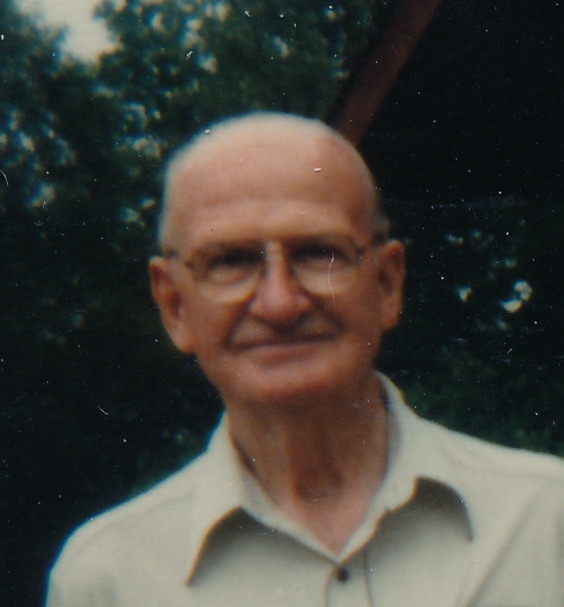 He will be sadly missed by three grandchildren Nathan, Alonna and Michelle Shier, a sister Joan Shier of R. R. 3 Flesherton and a brother Gerald (Linda) Shier of Mitchell. 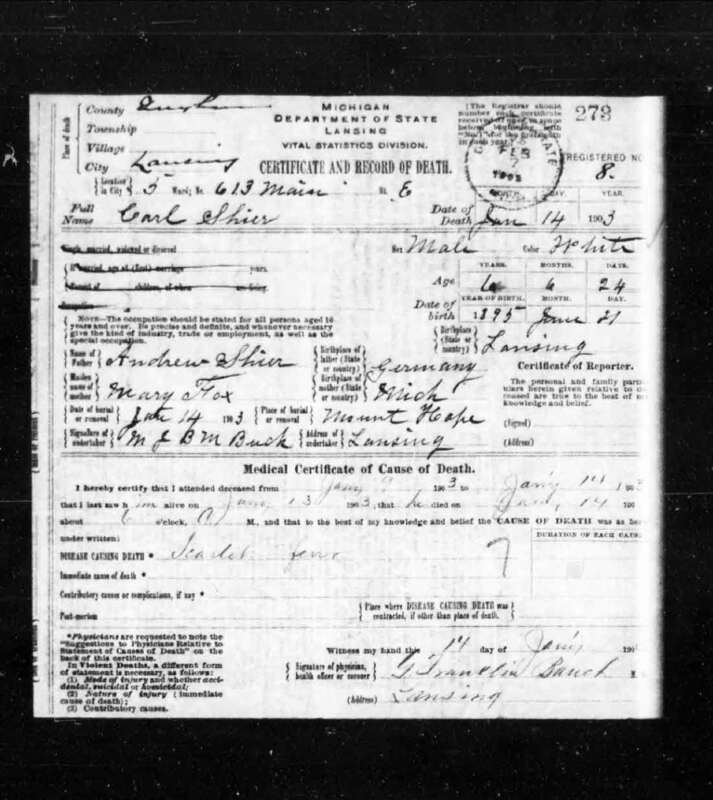 Survived by his uncle Lorne (Mabel) Smith of Owen Sound. A Memorial Service will be held at the McMillan & Jack Funeral Home, Dundalk on Friday, April 22nd, 2016 at 1:00 p.m. Visitation will be held on Thursday, April 21st, 2016 from 2:00 to 4:00 and 7:00 to 9:00 p.m. Donations to the Heart & Stroke Foundation would be appreciated. Death* Brian Scott Shier died on 27 June 2018 at age 64; t is with great sadness that we announce the passing of Brian Scott Shier. He passed peacefully at home on June 27, 2018 after a long struggle with heart complications. Brian was a loving husband, father and grandfather, brother, uncle and friend to many. He is survived by his wife of 44 years, Lorraine Shier (Herbacz), his daughter Angela Meshell McMillan (Shier), grand-daughter Alicia Grace McMillan, son in law Duncan Alexander McMillan, brother Martin Ward Shier, sister Tracy Lynn Shier, and step-mother Flora Shier-Totaro. He is predeceased by his father, Morris Cecil Harvey Shier, his mother Gladys Shier (McLumpha) and his brother, Michael Francis Shier. Brian was loved by family and friends, always making everyone smile with his jokes and booming laughter. Lots of people knew him as “Kamala”. He loved fishing, boating, and long camping trips with his wife, Lorraine and daughter Angela. In his younger days, he enjoyed playing football, tennis, golf, wrestling and arm-wrestling. Retiring in 2000, Brian was a lifelong employee of the CPR, as was his Dad, “Smokey”, and his brother Mike. Never judgmental, he had friends from all walks of life and just enjoyed the company of others. There will be a mass held in his honour at Notre Dame Church on July 14, 2018 at 11:00am with Father Rudy Manaloto officiating All are welcome. Engagement* He was engaged on 10 March 1927; and Emma Edith Beattie. 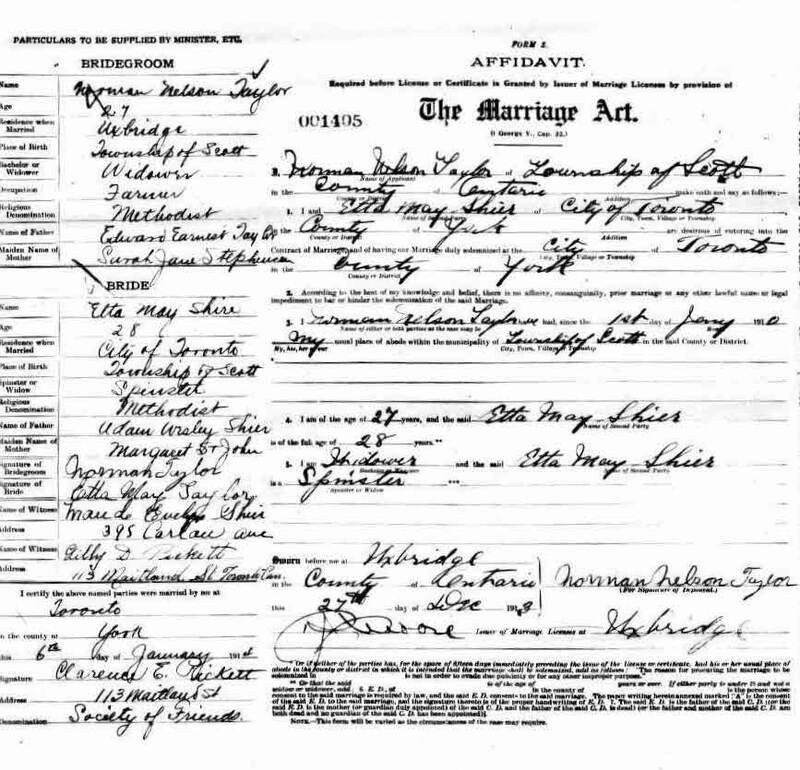 Marriage* He married Emma EDITH Beattie, daughter of Thomas Henry Beattie and Ada Abigal Lindsay, on 21 May 1927 in Caledonia, Haldimand County, Ontario, Canada. 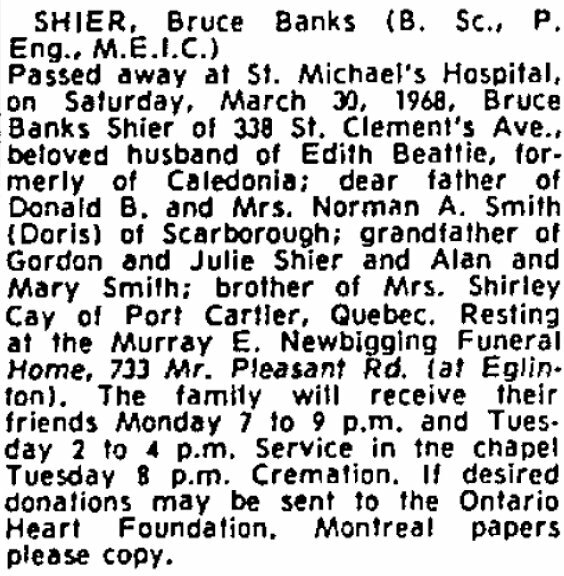 Death* Bruce Banks Shier died on 30 March 1968 in St. Michael's Hopsital, Toronto, York County, Ontario, Canada, at age 66. 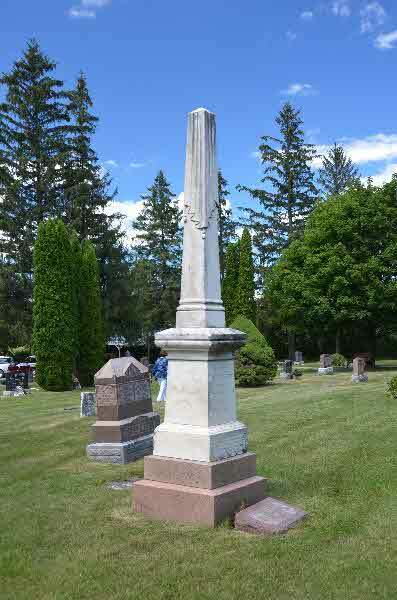 Burial* He was buried in Quaker Hill Cemetery, Uxbridge Twp., Ontario County, Ontario, Canada. Death* He died on 15 February 1911 in Uxbridge, Ontario County, Ontario, Canada, at age 72. 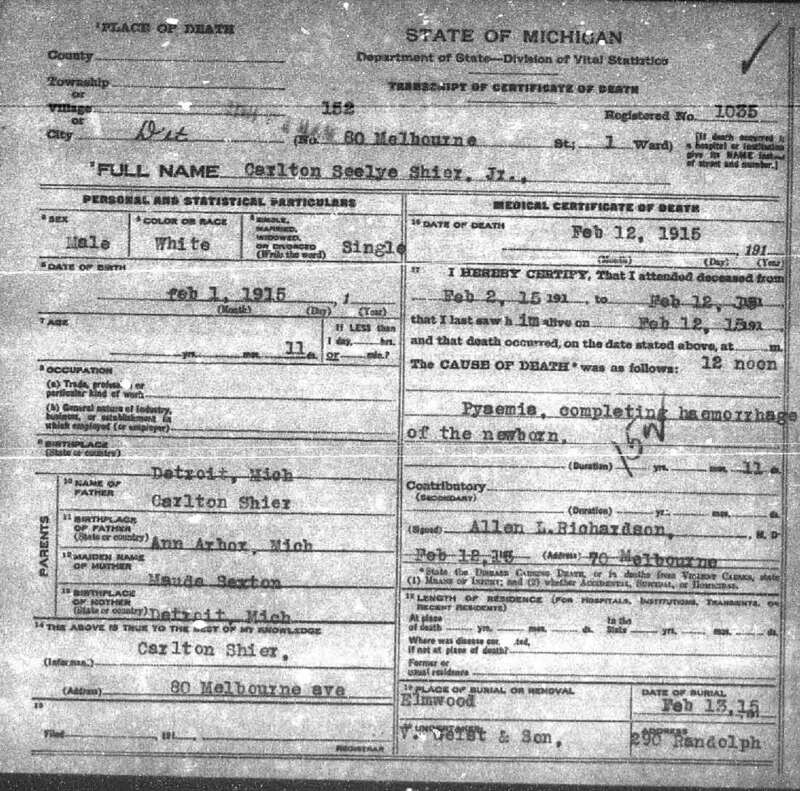 Marriage* Caretta May Shier married Norman Nelson Taylor, son of Edward E. Taylor and Sarah Jane Stevenson, on 6 January 1914 in Toronto, York County, Ontario, Canada. 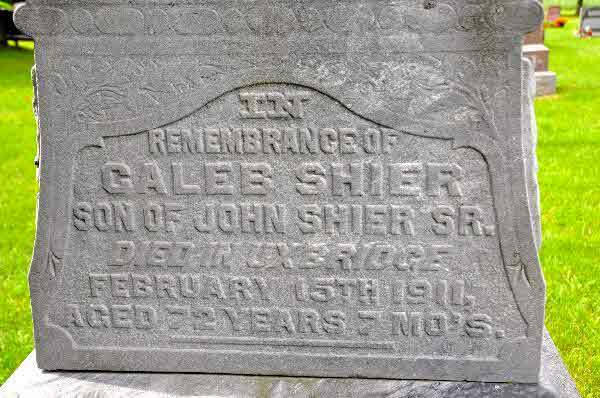 Death* Carl Shier died on 14 January 1903 in Lansing, Ingham County, Michigan, United States, at age 7; due to scarlet fever. [S17] Unknown author, findagrave.com (n.p. : n.pub. 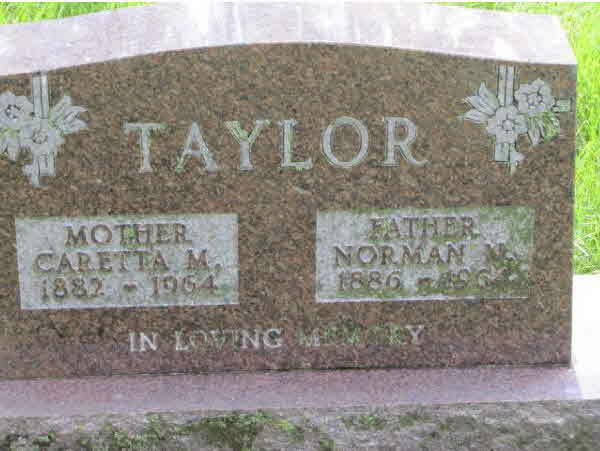 ), Findagrave Memorial # 154953585. Death* He died on 4 August 1991 in Lake Worth, Palm Beach County, Florida, United States, at age 88; Carlton A. 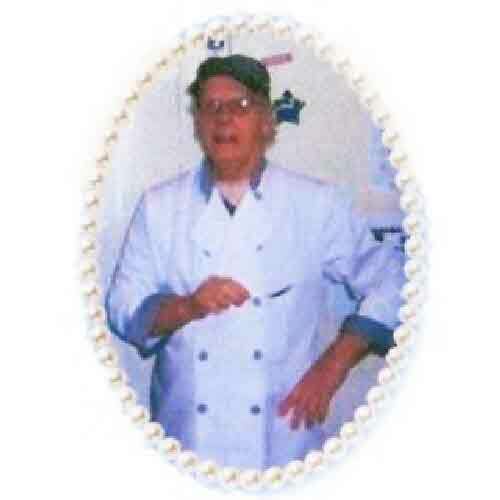 "Pa" Shier, of Lantana, Florida, formerly of Chipplegate Rd., Toledo, passed away August 4 at age 88. 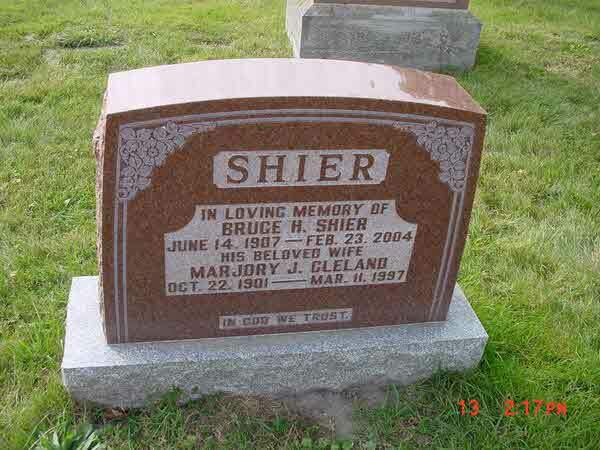 Mr. Shier was a stone cutter many years for Toledo Cut Stone Co. Surviving are his son, Donald R. and wife Kate of Toledo; daughters Mrs. Jeanne E. Ruth and husband Avon, of Downing, Mo; grandchildren, Terry Shier, David, Phillip and Bryan Ruth; 7 great-grandchildren. Friends may call at the Bersticker-Scott Funeral Home. 3453 Heather-downs Blvd. at Byrne Rd. after 2 PM Wednesday where services will be held Thursday at 10:30 AM. Interment Toledo Memorial Park. Family suggests contributions to the American Heart Assocation. 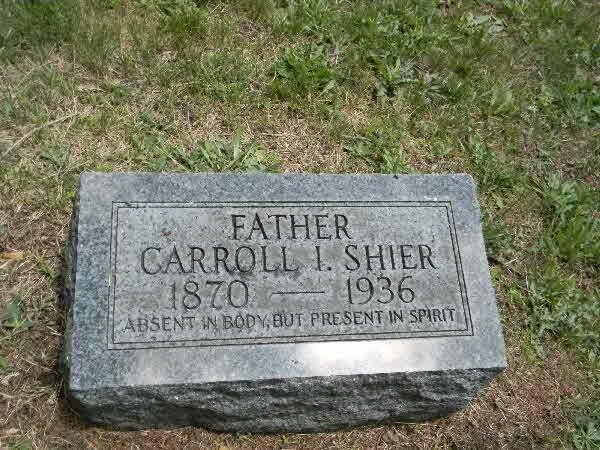 Death* Carlton Seelye Shier Jr. died on 12 February 1915 in Detroit, Wayne County, Michigan, United States. 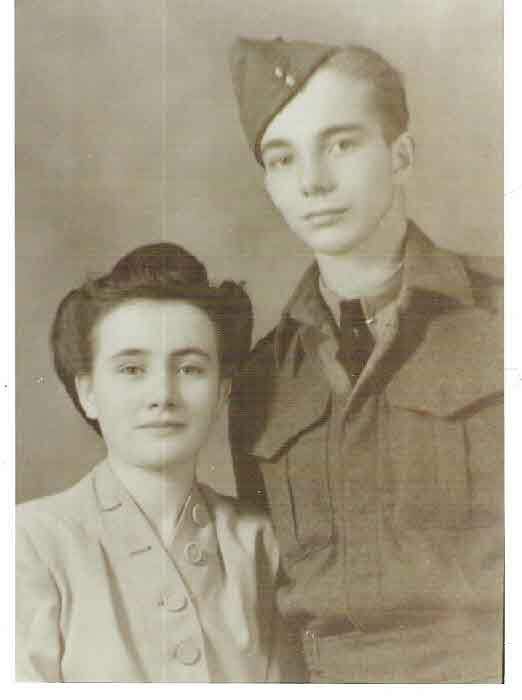 Fact 1 Photo of Carman Shier and his twin sister, Linda, prior to heading to Holland in 1945. Fact 1 He was discharged from the military. Death* Carmen Richard Shier died on 22 December 2015 in Southlake Regional Health Centre, Newmarket, York County, Ontario, Canada, at age 90; SHIER, Carmen (Carm) - At Southlake Regional Health Centre, Newmarket, on Tuesday, December 22, 2015, in his 91st year. Carm Shier of Newmarket, beloved husband of the late Margaret and dear father of the late David. He is survived by his sisters Linda Silver (twin), Verna Williamson and Gwen Brown. Predeceased by his sister June Lee and his brothers Wes and Trevor Shier. He will be sadly missed by brother-in-law Richard Bielat of New Jersey, his many nieces and nephews and dear friend Norm Smart. A celebration of Carm's life will take place at the New Hope Methodist Church, 337 Queen Street, Newmarket, Ontario, on Monday, December 28, 2015, at 1:00 p.m. In lieu of flowers, please consider a memorial donation to a charity of your choice in memory of Carm. On-line condolences may be made at www.roadhouseandrose.com. Fact 1* If anyone needed a helping hand, they never had to reach out further than to Carmen Shier. “He was generous, very generous. 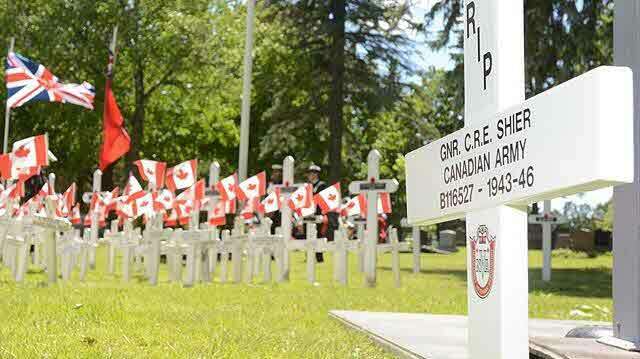 You have the cause and Carm would support it,” his friend, Norm Smart, said while reminiscing about Shier’s life at the Newmarket branch of the Royal Canadian Legion with fellow comrades Don Bishop and John King. 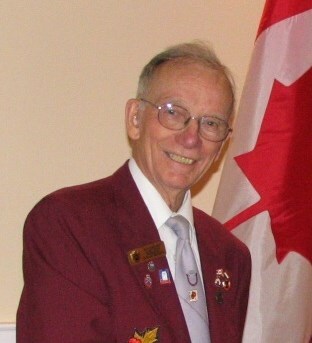 Shier, the last living founding father of the legion and a charter member of the Newmarket Veterans’ Association, died Dec. 22 at the age of 90. It was standing-room only at his funeral at New Hope Methodist Church on Dec. 28. “Sometimes, when you get into your 90s, you don’t think you have many friends around, but it (the church) was loaded,” Bishop said. “It was a tremendous send-off for a great guy,” Smart added. 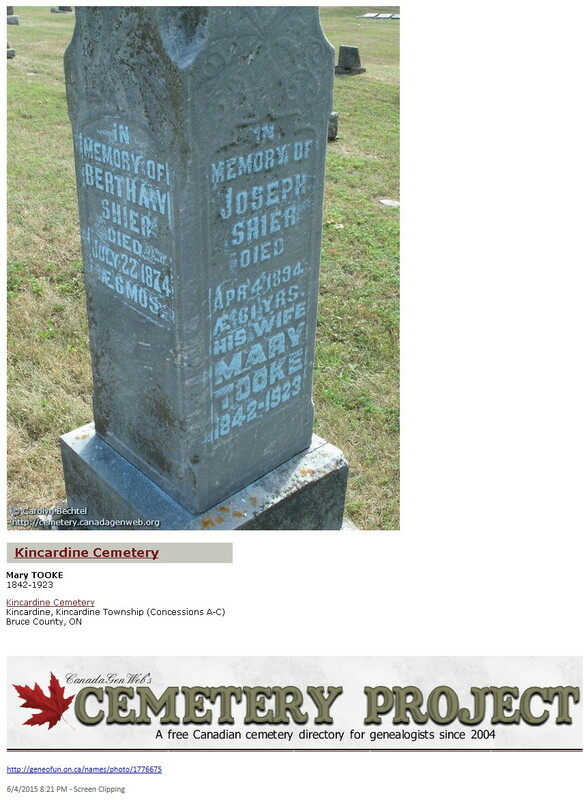 Shier enlisted with the 2nd Royal Canadian Artillery on Aug. 13, 1943 at the age of 18. After serving as a gunner in France, Holland and Germany, he was discharged on June 14, 1946. Shier was awarded the 1935 to 1945 Service Medal and the France Star. After returning home, he began a career as an aircraft worker. He met his future wife, Margaret, while she was working at a bank in Aurora and a romance blossomed. The couple had a son, David, who died about 20 years ago. Margaret died about 14 years ago after battling Alzheimer’s disease. “They most definitely had a loving relationship. When she was in hospital, he went every day to feed her morning, noon and night,” Smart said, adding Shier had a good sense of humour. In 1947, Shier joined the legion and over the next seven decades, served in a wide variety of roles, including first and second vice-president, sports officer, sick and visiting officer and a member of the financial committee. Always helping out at the branch, it was unheard of for Shier to turn down a request to help in any way. He assisted every year with the Remembrance Day poppy campaign, a cause near and dear to his heart. He also helped for many years with setting up the crosses and candles for the candlelight vigil at the cenotaph. Until it was cancelled, Shier helped with the legion’s annual soap box derby on Main Street. Always an active participant in the legion’s sports and recreation activities, Shier was particularly proud of being on the winning 10-man provincial championship cribbage team in 1960. “He was as proud as a peacock,” Bishop said. If Shier, an avid card player, ever lost a game, his friends at the legion would tease him by taking the championship plaque off the wall and vowing not to return it until he was on a winning streak. “‘I’ll have you up on charges,’ he’d say,” Bishop laughed. 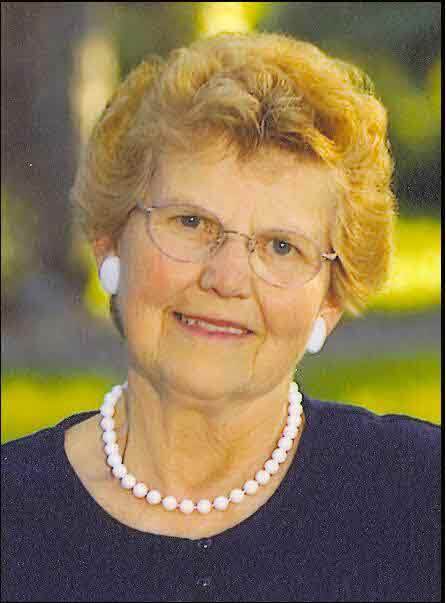 Shier was a founding member of the veterans’ association and served on the executive board for more than 30 years in many roles, including president more than once. One of his most noted contributions was performing the roll call every year at the Decoration Day services, a role he performed up until last June. Shier also played baseball in the veterans’ league in Bradford well into his old age. For 49 years, he volunteered with the annual Newmarket house league hockey tournament, always honoured to be the one to drop the puck on opening night. Shier was a proud member for many years of the men’s a cappella singing group, the Upper Canada Chordsmen Chorus. He donated financially to more than a dozen charities, including the Alzheimer Society of Canada, and also sponsored two children through UNICEF. Always up for anything, Shier and a group of friends began taking annual trips together after Margaret died. He enjoyed ice fishing and never met a breakfast he didn’t like. “He would eat breakfast four times a day. He loved to go out for breakfast. He loved fat and salt,” Bishop said. “And he was just a little guy,” King added. Shier was well loved and respected, Bishop said. “He was the type of man who would never say anything derogatory about any person. He always had something nice to say about everybody,” he said. “The women used to say he was a very sweet man, which was true. You can’t get around that,” he said. 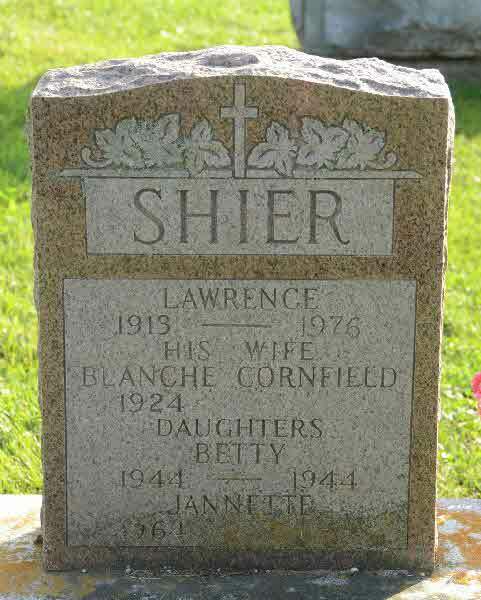 Shier is survived by his twin sister, Linda Silver, and sisters Verna Williamson and Gwen Brown, brother-in-law Richard Bielat and many nieces and nephews. 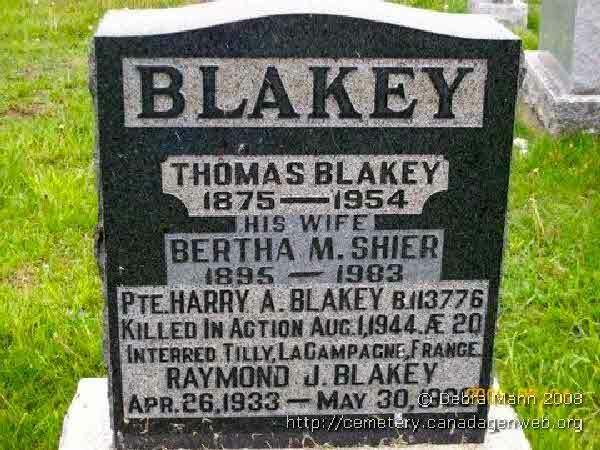 Burial* He was buried in Newmarket Cemetery, Veterans' Plot, Newmarket, York County, Ontario, Canada. Death* Carol Margaret Ida Shier died on 19 December 2016 at age 66; On the 19th day of December, a very strong person, kind hearted, fighter until the very end. 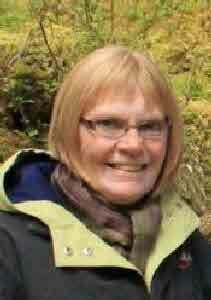 Carol was born June 15th 1950 in Oxbow SK. She grew up in Glen Ewen SK. In September 1970 she met her lifelong husband Harvey. Married November 20th 1970. The 2 of them resided in Carroll MB. In August 2004 they decided to move to Brandon MB. 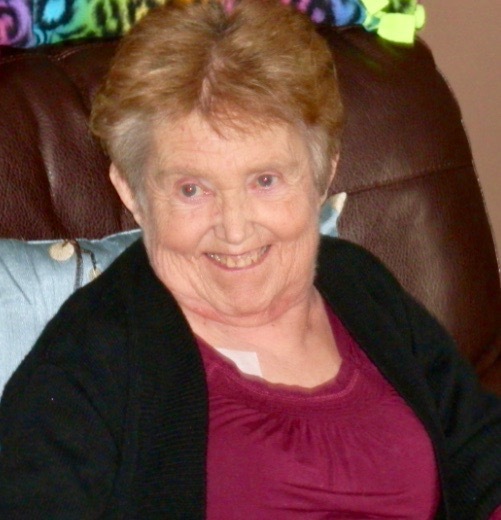 Carol passed away peacefully with her family by her side at the Assiniboine Centre. She was predecesed by her parents Carl and Evelyn Shier of Glen Ewen SK. Carol was their only child. Leaving to mourn her passing are her husband Harvey Bartley, oldest daughter Carla (Dallas) Dufrat and 3 children Bryanna and Rylee McRuer and Zach Dufrat. Youngest daughter Marla (Chris), Sierra, and Trinity Rouire. Along with extended family. Most of her life has been a battle. In 1981 she was diagnosed with kidney disease which then was followed by peritoneal dialysis. In July 1986 she was blessed with a kidney transplant which lasted for 26 years. In October 2012 the transplant had failed and had to go on hemodialysis. The last 4 years have been a struggle for her with other diagnosis also. With all the struggles that she went through, you would never hear her complain! She has taught us all great life values and how to never give up. Her favourite saying was,” it’s never so bad that it can’t be worse!” With all the struggles and hurdles that she went through, she would be the one to know this. May you rest in peace Mom, your struggles are over! If so desired donations may be made in memory of Carol to either the Dialysis Unit or Palliative Care Unit in Brandon c/o Brandon Regional Health Centre Foundation 150 McTavish Avenue East Brandon, Manitoba R7A 2B3. Burial* She was buried on 4 July 2014 in Ryley Community Cemetery, Beaver County, Alberta, Canada. 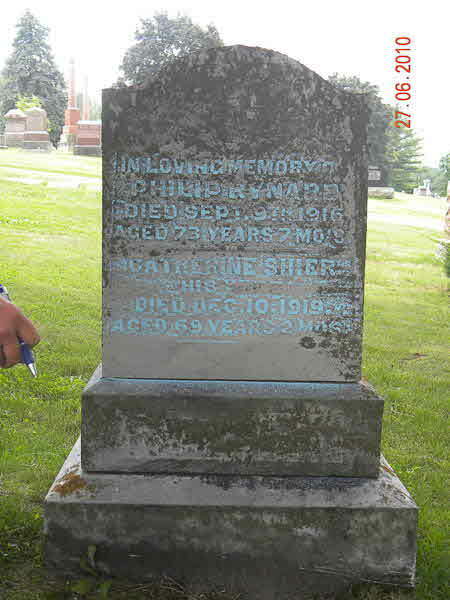 Death* Caroline Shier died on 3 August 1869 in Huron County, Ontario, Canada. Death* Caroline (Carrie) Sarepeta Euphenice Shier died on 27 December 1935 in Sarnia, Lambton County, Ontario, Canada, at age 73. Burial* She was buried in Northbrook United Church Cemetery, Lennox and Addington County, Ontario, Canada. 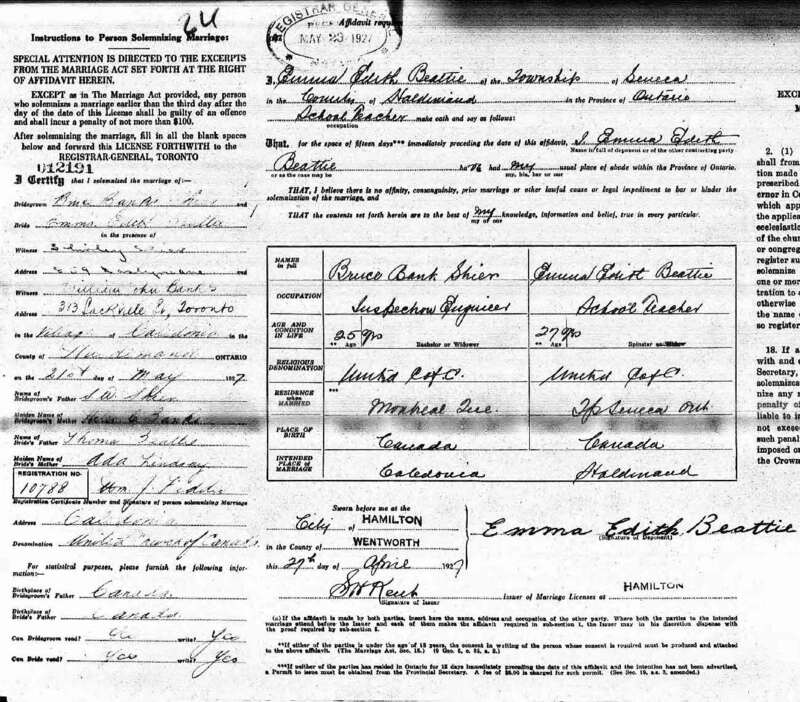 [S3] Unknown household, April 1901 Census of Canada, unknown repository address, unknown repository. 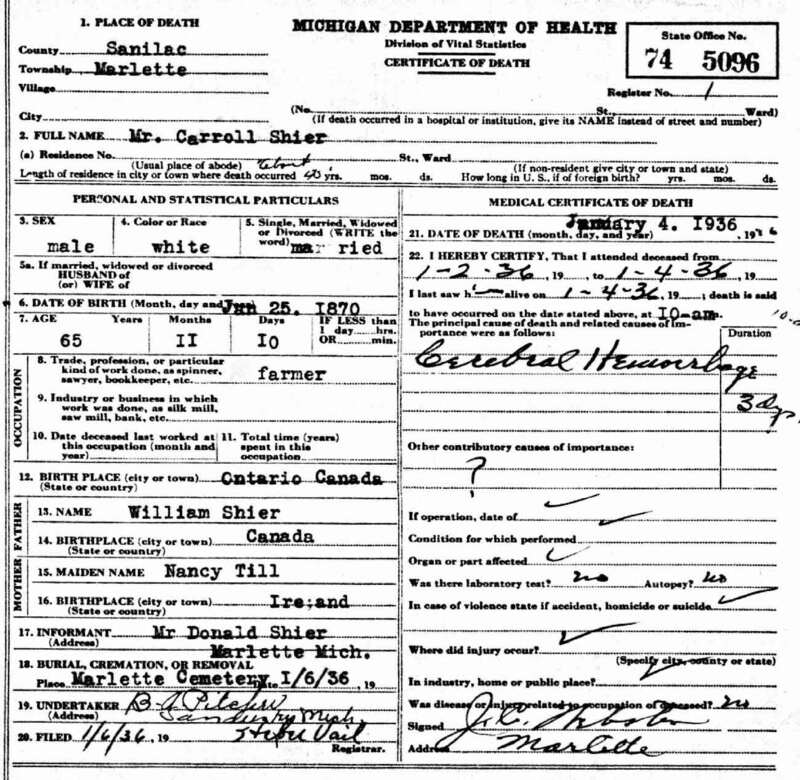 Census Carroll Iveson Shier appeared on the census of 4 May 1910 in Marlette Twp., Sanilac County, Michigan, United States; Carl Iveson Shier and Ruth Jane Cuthbertson Laverette farmed next door to his sister, Mary Jane Cooper. Death* He died on 4 January 1936 in Marlette Twp., Sanilac County, Michigan, United States, at age 65. (Witness) Fact 1 Catherine Shier witnessed the Fact 1 of Samuel Shier on 22 May 1822; Samuel Shier received a reference from him Irish clergy before departing for America.The reference was for his brother-in-law, Richard Shier, and his sister, Catherine. Richard and Catherine attended the Methodist Church; Samuel attended the Church of England. Death* She died on 18 February 1882 in Brock Twp., Ontario County, Ontario, Canada, at age 81. 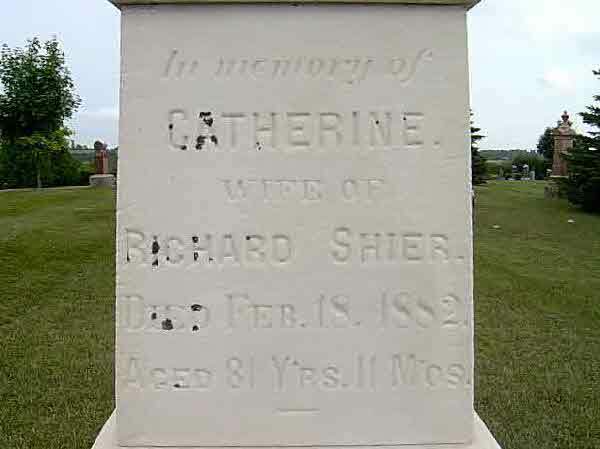 Death* Catherine Shier died on 15 December 1919 in Georgina Twp., York County, Ontario, Canada, at age 68. 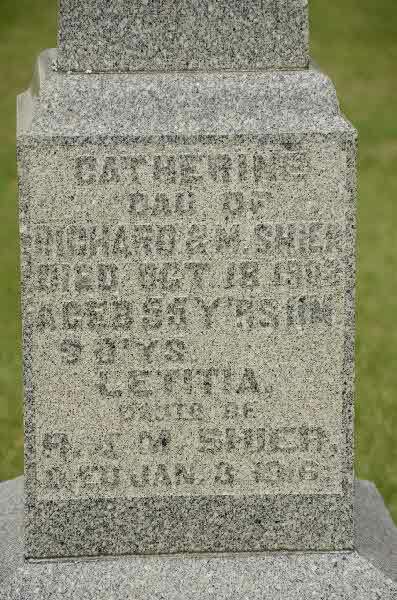 Death* Catherine Shier died on 18 October 1908 in Brock Twp., Ontario County, Ontario, Canada, at age 55. Burial* She was buried on 20 October 1908 in Necropolis Cemetery, Brock Twp., Cannington, Ontario County, Ontario, Canada. 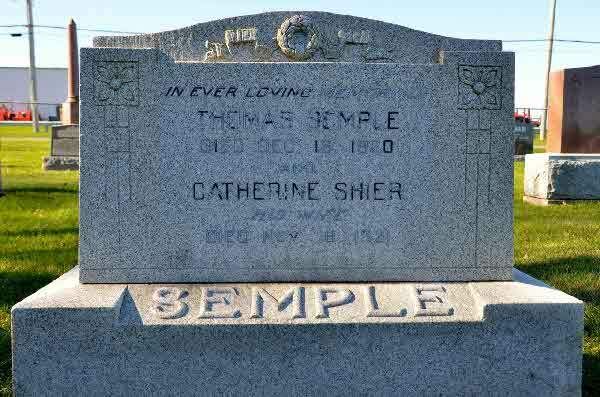 Marriage* Catherine Shier married Thomas Semple on 17 March 1880 in Brock Twp., Ontario County, Ontario, Canada. Death* She died on 18 November 1921 in Sunderland, Ontario County, Ontario, Canada, at age 66. Burial* She was buried on 20 November 1921 in Sunderland Cemetery, Sunderland, Ontario County, Ontario, Canada.